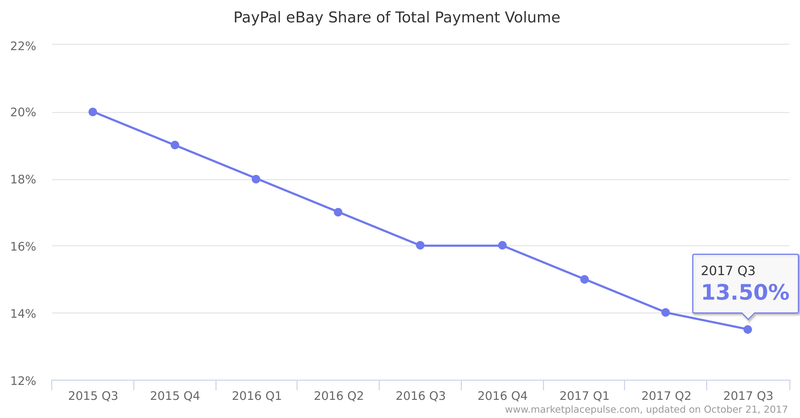 In the last quarter PayPal transactions volume associated with eBay represented 13.5% of the total, compared to 16% last year, and 20% two years ago. Since the companies split in July 2015 the volume of transactions from eBay has increased, but PayPal has been able to grow in other areas beyond that. When Paypal split from eBay the deal included a condition that eBay must conduct 80% of transactions via Paypal as a way to guarantee a source for revenue for PayPal. This will be in effect for five years from 2015, with a one-year transition. If PayPal processes more than 80% they will pay $13 million for each percentage point, and if eBay falls short it will compensate PayPal at the same rate. The deal also meant that eBay can’t start their own payments processor, and that PayPal wasn’t going to launch a marketplace. However it’s only been 2 years since the split, and PayPal has already made considerable progress to depend less on eBay. By the time the five year deal expires it won’t be a major risk. Looking back, eBay acquired PayPal all the way back in 2002 for $1.5 billion. Arguably eBay didn’t know what to do with it though. Integrating PayPal deeply into eBay was the main reason for doing so, but not much else happened beyond that. The split pushed by some of the investors famously against the vision of then eBay CEO turned about to be the right move. PayPal never realized its full potential under eBay. As PayPal was indecisive about what it wants to do, it created a gap in the market for companies like Stripe and Square to be created. Both of which have grown to be major players in payments, with Stripe allegedly processing some of Amazon’s payments. PayPal should have been there. This isn’t as much criticism of eBay as it showcases why acquisitions don’t always turn out well. When eBay acquired Skype in 2005 it too couldn’t do much with it, and thus later sold it to Microsoft. And yet PayPal market cap is $85 billion today, more than double that of eBay’s $40 billion. Today PayPal is doing more than what most think of PayPal as a product. It has a peer-to-peer (P2P) payments service called Venmo, now representing 21% of total transactions volume. Though it is still yet to make any money. Then there is the payments gateway Braintree which PayPal acquired in 2013, and has since grown considerably as it powers major services like Uber behind the scenes. PayPal now is integrated in more things behind the scenes as it is a brand on its own. All of this has meant that PayPal Total Payment Volume has continued to grow and reached a over $400 billion/year run rate. 35% of which is done on mobile, a crucial metric.